The article at Gourmet explains how to stew the cute little fellows in red wine with vegetables. 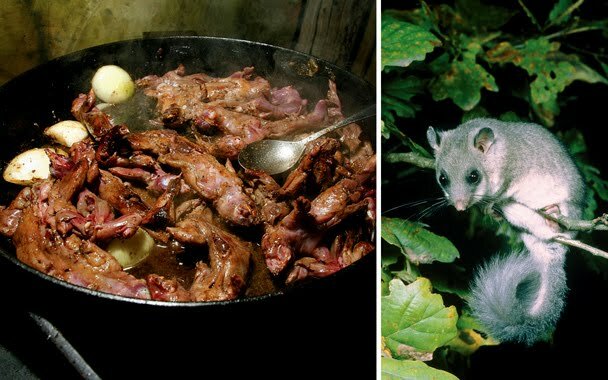 The edible dormouse actually has "edible" as a standard part of its name. The "dormouse" "comes from Anglo-Norman dormeus, which means "sleepy (one)"; the word was later altered by folk etymology to resemble the word "mouse". The sleepy behaviour of the Dormouse character in Lewis Carroll's Alice's Adventures in Wonderland also attests to this trait... Dormouse fat was used by the Elizabethans to induce sleep." Presumably it is the fat stored for hibernation that makes them such a culinary delight. Left photograph by Borut Peterlin; Right photograph by Robert Spoenlein/zefa/corbis. The Roman Edible Dormice, (also called Gli-Gli) are much bigger than the tiny Dormice native to England. Some Gli-Gli escaped from captivity just North of London appx 100 years ago and now live in 3 counties. I live on the NW edge of London and had an infestation in a kitchen roof space. They look like a smaller version of grey squirrels and are equally pests, but not designated as pests, so it is very limited what can be done to eradicate them. I would eat them, but would never dream of eating the native and adorable tiny dormice. Cats wont allow them to live in my garden anyway.